Kyôgen 10 The Ridiculous Précieuses | Digitalestate Inc.
“The Ridiculous Précieuses” is the adaptation of the comic play “The Ridiculous Précieuses“ by Molière, French actor, playwright and theatrical organizer in the 17th century to revive it as a piece of Kyôgen, traditional Japanese art. To purchase a printed book (print on demand), click on the image below to jump to the URL. Please enjoy “The Ridiculous Précieuses” in preview. 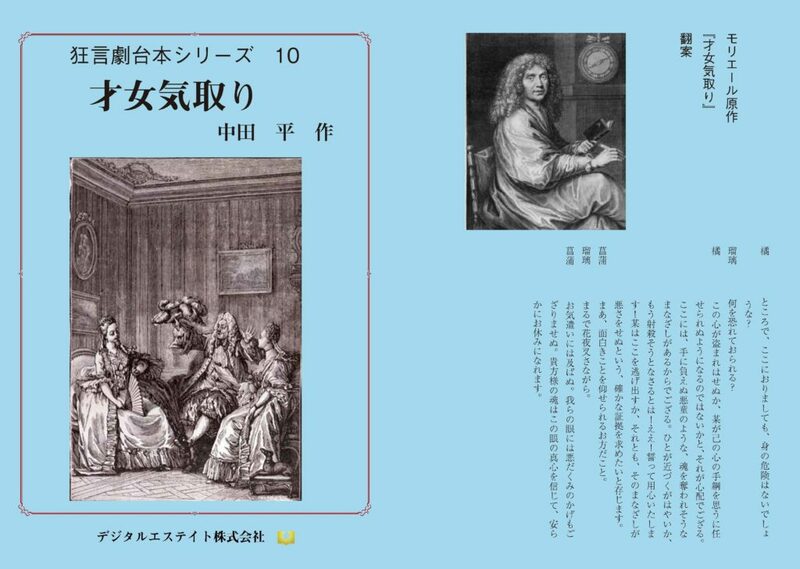 This preview is allowed to use BiB / i (EPUB READER on your Website) by Mr. Satoshi Matsushima. The scene is Kyoto. At Gonzaemon’s house. Ayutyosuke and Koinosuke were coldly treated and their court are denied by Ryozonmo’s daughter and niece. They are very dissatisfied with the contemptuous reception and foresee revenge by using Tachibana, valet of Ayuunosuke. Gonzaemon, wanting them to marry the two young men, in order to understand the reason, calls Ayame and Ruri, who are acting like a precious woman. As well as Gonzaemon do not understand their speech, he stubbornly: he wants to marry them as soon as possible, or otherwise they will be sent to the convent. Mr. Tachibana, this so-called noble appears here. He is a man who loves the aristocracy, and he has a hobby that does not suit his status as poetry and fashion, so the conversation comes alive with the precious ones. There, Mr. Kikyo, the valet of Koinosuke, joins in and everyone enjoys the conversation between them knowledges. Meanwhile, Mr. Tachibana, in good spirits, called the shamisen players, and started dancing. Then Ayuyosuke suddenly entered there and started to hit Mr. Tachibana with the stick he was bringing. Ayame and Ruri are shocked that Ayyousosuke and Koinosuke revealed that Tachibana and Kikyo were just their valets. Realizing their mistake, the two precious ones let out their spite. Gonzaemon can only suffer such insults, anger, makes the girls dedicate jousting novels, worms, fashion to all the devils. Click the icon below to jump to the leader.